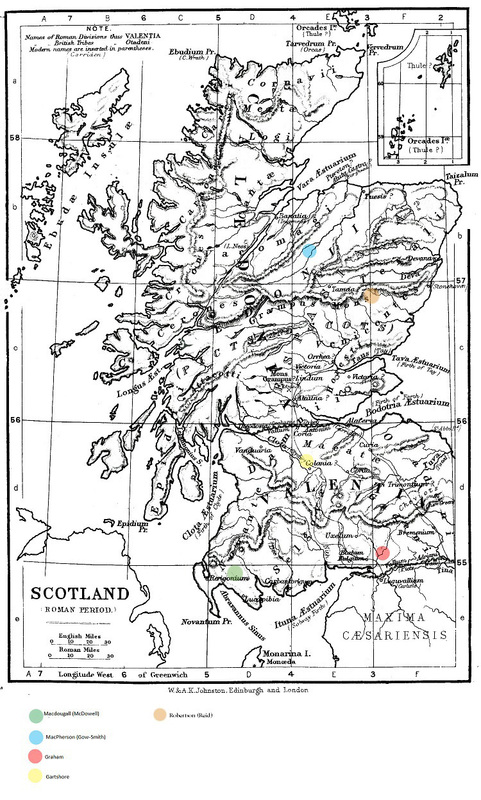 I have plotted my ancestors on this map of Roman Scotland. This is a little hypothetical in that this is where they were from 1600 AD onward. It puts them in context a little. You can see my Grandmother’s family (Smith and Gartshore) ensconced in the more prosperous area of Glasgow where they would have been more Britonic. My two gg grandparents, Will and Sarah’s families (Graham and McDougall at opposite ends, Sarah growing up just above Hadrian’s wall and William’s family being further north in their original setting. William’s family would have been definitely Gaelic. Two of William’s daughters married into the Fraser family but I didn’t plot them because they are not blood relatives. Later, I will plot the families on a medieval map which should give a better idea of what ethnic and language groups they fell into. Here is an interesting article about Scottish surnames. This entry was posted in Sarah Clark, Scotland and tagged James Smith and Marion Reid Gartshore, Sarah Clark by Shamwest. Bookmark the permalink.